CNN speaks with Fareed about the downing of Malaysian Airlines Flight MH17 and how the West should respond to Russia’s alleged role in assisting pro-Russian militants in Ukraine. 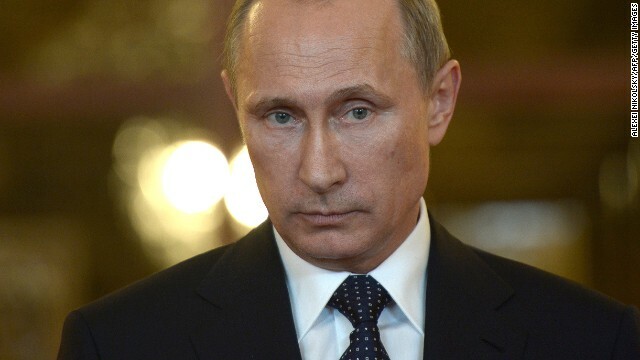 Is Russian President Vladimir Putin getting increasingly isolated, do you think, at this point? He is getting isolated internationally, though you will notice that many European countries have still been very, very reluctant to confront him directly and to publicly demand that Russia do things. The Malaysian government has not done it. Russia is a big country, it has a United Nations veto, and most importantly, he still has a great deal of support at home. Remember, the version of events that Russians are hearing is a kind of alternate reality in which they charge that the Ukrainian government is responsible, even though the Ukrainian government doesn't actually control the territory from which the rockets were launched. They claim that the Ukrainian government might have been trying to shoot down President Putin's plane and missed. So, there's a whole fabricated alternate reality, and Putin remains popular in Russia. So, while he's getting more isolated internationally, it isn't clear that the domestic pressure, which is what he worries about, has risen at all. As you point out, it's his domestic constituency that he cares about most. But given that you've suggested that he’s getting increasingly isolated, what do you think the consequences of that are, so far as his relationship with the international community is concerned? I think it’s placing Russia in a position of deep uncertainty with regard to business investment, with regard to diplomatic dealings, with regard to almost all those kinds of things that Russia does care about. Remember, Russia is not Iran. Russia is a country that needs foreign investment. It sells its debt on foreign markets all the time. And so there are ways in which the Russians have to deal with the world and need the world. So, Europe has many strong cards in this regard. If the Europeans were to decide to push harder on economic sanctions, it would have a very important effect. Putin does care about all that, because Russia is integrated into the world economy. That is the leverage Europe has. Next entry »A rival to the World Bank? Actually @ s, hes in his early 40s. Physically anyway. Before Malasyan plane was shot down there was a prolonged intermission by CNN/BBC in reporting on Ukraine civil war. Zakaria was also quiet for a while. The fact that plane was directed through region of war where several planes were already shot down just underscores the fact that international community was largely ignorant of what is going on in Ukraine and did not take it seriously. The civil strife in Ukraine is not new. Ukraine region of Kiev is a starting point of Russia back in early middle ages. At the times of Ukraine/Russia origin both regions were ruled by same knights. Separation took place when rulers settled more towards northern areas. Whatever was called Ukraine in 17-th century voluntarily incorporated itself into Russia. Conflicts within Ukrainian population about disagreements on whether to be separate or part of Russia were going on and off from the time Ukraine/Russia can trace its history. One of the more notable episode was a war between Peter the Great and Ukranian insurgency at Poltava (early 18-th century, when Swedish king sided with insurgents). About 10 million ethnic Russians live in Ukraine; about 3-4 million Ukrainians live in Russia. Uncountable (millions of people) families have both Ukrainian and Russian sides. Ukraine never had an experience in independent statehood until 1991, when Soviet Union broke up. After revolution in 1917, the Bolsheviks organized a republic of Ukraine as part of Soviet Union. In 1920’s large parts of land (present day Estern Ukraine where civil war is going on) were transferred administratively from Russian Federation to Ukraine. This resulted in major Russian population in Eastern Ukraine. In 1954 Crimea was transferred from Russian Federation to Ukraine. The present outburst of conflict was a result of many factors: 1. Mulfunctional state of Ukraine 2. Lack of agreement about degree of participation in European Union 3. Nationalistic riots 4. Concern of USA about Russia becoming stronger politically, economically and militarily over last 10 years, and therefore desire of US policy-makers to have leverages in the regions close to Russia. 5. Interference of the USA and support to Ukraine’s politicians who usurped the power in Kiev back in February 2014. Hey Dr. Harper – BREAKING NEWS – the U.S. does not need Russian oil or gas. We'll be out-producing the rest of the world in the next few years. What we need to do is get away from religious nuts who want to even a 1500 year old score. We also need to forget about Russia as a partner. Putin's taken them back to the old days of Stalin and cult of personality. Its true that the USA doesn't need Russia for their oil and gas but the statement about the USA being the worlds biggest oil and gas producer in a few years is a bit off. Canada's oil sands alone produce more oil than all of the USA and Canada also has more conventional oil and gas than the USA. With that being said Saudi Arabia has even more than Canada. Fortunately, Canada is our best neighbor and one of probably two closest allies. Hey Dr.Rich – BREAKING NEWS – the US has never been a market to Russian oil and gas, for the same reason that EU and the rest of the world will never be a market for American Oil and gas: logistics. Economically it is not attractive. Of course you can make your European lapdogs buy it from you, after all, the harder it gets for Europe, the better your own economy looks in comparison! You are not Russian partner, and you have never been! Stop kidding yourself, nobody believes you anymore! > We'll be out-producing the rest of the world in the next few years. You're actually behind the times. The giant deposit that had energy folks saying we'd be outproducing the rest of the world someday has been found to largely be a bust. We don't have nearly as much gas and oil and shale as we thought we did. Don't be juvenile! Putin is part of the BRICS group. They are a huge challenge to the IMF- and have already knocked the US dollar off its perch as world reserve currency. The US is becoming more isolated [and bankrupt] – you've ;lost credibility as a world power [ and are now a world joke] The EU are going easy on Russia; France is delivering their 2 new warships backed by UK; and Germany is light on sanctions because they are desperate for Russian gas and oil! So dream on with your pie in the sky "We're the greatest" rubbish and move with the times. BRICS is made of one rich country, China, the rest are broke. And wait till the real intentions of China come out. I find it interesting that such a large country as Russia, with an intelligent population, can't manage to produce a single item which is sold on world markets. Beside natural resources, weapons and matryoshka dolls, name one product that Russia produces for export. Such an absolute dearth of exports indicates something very wrong in the structure of the country. The fact that Russia has the highest degree of wealth concentration in the world, such that 110 people control 35% of Russian national wealth, while vast segments of the population live beneath a very low poverty level ($200/month), might point to the problem. Sarah, the world needs you now. Where are you ? She is too stupid to show up. In addition, she's afraid of Russians, isn't she? Sarah and Mitt Romney BOTH told Obama that Russia was the #1 threat to world peace. The Obama thicko sneered and said the cold war was over......................................Now the whole world knows for sure that the rumors of Obama's lack of anything remotely resembling intelligence are TRUE! We need to isolate the tea baggers. Put them all in surplus World War 2 German cattle cars and ship them to Mexico. Awesome. What's it like being stuck in 2008? You should invest in Apple. I bet they have lots of neat products coming out in the near future. Russia has always liked to bellow and bluster. However they view the world really doesn't matter. Investments into the Russian economy will wane and wither on the vine. The price of oil will drop and then Russia will be in deep dangerous water. Putin has been making many irresponsible mistake lately and I question his mental stability. All the oil in the world can help Putin and Russia buy their way out of decline now. It is only a matter of time. Putin should starting thinking of a long term reproach with Europe and the US, unless he's good at speaking Mandarin. All this right-wing, anti-Russian, lynch-mob mentality here is getting to be quite nauseating. We Americans truly need to clean house before throwing stones! I agree. Let's start cleaning house by sending people like you and sly to North Waziristan so you can play with your friends. I hear they sometimes use infidels' heads as soccer balls. Putin , Merkel, Hollande ...is there really a difference? They all have blood on their hands from this terrorist Russian act co-ordinated by Putin & supported by Merkel & Hollande. You appear to be psychotic. you mr. menisino are right on the money ! for the first time sence ww2 the germans and french have to act and they blew it. and now every one knows it. so now the russians ,germans, and the french are all N.F.G. now we know it so lets not forget and move forward ! Indeed, and the Pope is getting more catholic. Putin is so isolated! Europe grovels at his feet, worried that he might shut off Russian gas and oil. The US worries that he might not bring American astronauts back from the Space Station. He already is supporting Iran, and North Korea. China loves him. The Russian people love him, because he has given them pride in the strength of Russia. Then, there's Obama. He isn't isolated. Obama is loved at Democratic fundraisers. Once again, the E.U. led by Merkel & Hollande have decided on a "scotch tape & bubble gum" approach on sanctions on Putin & Russia. So down the line expect more terrorism in Eastern Ukraine, thanks to Merkel & Hollande. No terrorists in the Ukraine – those are citizens involved in a Civil War. Americans like to label their enemies as 'terrorists' or 'insurgents'. Our enemies in Iraq were not insurgents: they were brave freedom fighters trying to rid their nation of an evil invader. Thank goodness leaders like Obama and Merkel and Hollande have the wisdom to stay out of other nations civil wars. (sure wish JFK, LBJ and Nixon had such insight during the Vietnamese Civil War). The only evil is people like you who attempt to destroy America from within and allow the world to be enslaved by brutal dictatorships. I sure am pretty evil! But ... once again Yak, I think you are a little misled. The only American's trying to destroy America are right-wing-racist-skinhead-Nazi types, like the OK City Bomber, the Olympic Bomber, the Wacko from Waco, some senile old Rancher in Nevada, some cop-killer in Arizona. Us lefties are happier smoking pot and listening to Elvis Costello ("whats so funny about peace love and understanding"). Naive, ill-informed, backwards, hateful, high, reactionary, stupid, and a criminally destructive weak sister? Definitely! You thought Vietnam War was a civil war? Vietnam was a wedge that the U.S used in dividing (separating) the potential partnership between Soviet Union and China. Kissenger said his nightmare was the Soviet Union and China started WWIII to establish a new world order. How could the U.S and its allies deal with forces of China and Soviet Union COMBINED? Loyalty lies in interests but as human being it is HARD to have a clean conscience. Putin is showing what a real coward he is. We all no that it was the rebels who shot down flight 17. I'll give them the befit of a doubt that it probably wasn't on purpose, they most likely thought it was a Ukrainian Plane. However when Putin sits back a denies it he is showing what a gutless coward he really is. Would it be desirable, ethical, legal or feasible to ban all flights to and from Russia over an extended period of time? Why? Just don't fly over any neighboring war zones and everyone will arrive safely. Do you have something againest Russia? I can't think of anything they've done recently that poses any problems – they helped implement Obama's disarmment of Syria'a chemical weapons, and they've helped in our negotiations with Iran. Russia is just another large powerful nation – and frankly they operate much as we do. I'd be glad to supply you with a one-way ticket to Russia, you wannabe commie! That is quite kind of you ... unfortunately, you seem to have a limited understanding of world history. There is this tool on the Internet called 'Google'. Please use it to discover when Russia became a Democracy. (While you are at it ... look up the definition of 'communism', because I seriously doubt you could explain it). But, please send me the plane ticket. You'd be surprised to know that many airlines actually fly to Russia since the 1980's, and I believe they also schedule return flights. HAHAHA! Twice in one day your ignorance has made me laugh out loud. A wannabe commie trying to school me on history, too funny. I'm sure you believe all the wild stories your hero Putin is making up about this plane being shot down, too. For what ever reasons, the EU and USA increase the economic sector sanctions against individuals and businesses in Russia, apparently to change Russians' behavior, whatever that is. When whatever you are doing appears to not be enough, it is time to change methods. Would it be desirable, ethical, legal or feasible to ban all flights to and from Russia over an extended period of time, in addition to the sanctions leveled that appear not to be enough? Perhaps, it could help for good measure to implement also a total interdiction of shipments of goods and services. Would that be desirable in terms of what the EU and USA want to obtain from the sanctions already in place? Ethical in terms of how to deal with Russians such as Putin? Legal in term of international laws? Feasible in terms of adverse consequences that may befall the EU and USA? Do I have something against Russia? I have nothing against Russians in general. Yakobi ... some famous communist once said "laughter is the opiate of the people", so I am happy to have made you laugh – and twice! Unfortunately, I have few 'hero's in the Superpower Governments: not Putin (too wierd), not Obama (too moderate), not the Chinese guy (too controlling). Fortunately, I do have a lot of patience, and I've found that it is usually best to know the facts before dropping the bombs. I remember this place called 'Iraq' where some buffoon claimed their were "WMDs', and then he dropped a bunch of bombs (supported by 93% of the American foolish public). The funny part? There never were any WMDs! Ho ho ho. So ... I'm happy to wait for the facts here, and frankly, I don't care anyway. They have a civil war, it's their business, and someone (doesn't matter who) shot the plane down by accident. The difference between 'them' shooting down a commercial jetliner, and America doing it, was that when we did it, it was not an accident. Geez, your "facts" are about as well researched as your knowledge of history. Your hero Karl Marx is the one who wrote "[Religion] is the opium of the people." And I see you know nothing about the incident when the U.S. shot down an Iranian Airbus. I'd say "get your facts straight", but you don't have any! If he is "isolated" will that stop him from doing what he is doing? Interesting phrase "even though the Ukrainian government doesn't actually control the territory from which the rockets were launched." How do you know for sure where the rocket was launched from? Where is the evidence, proof? Or to repeat somebody's words is the proof? It's more than cynic to blame Russia without any investigations and proofs. Let's put it this way: Who do you believe, John Kerry or Vladimir Putin? Of course he believes Obama! Obama well known for only telling the truth, like Bush before him! And Obama has got the Nobel Peace prize too! LOL! Y'all would seriously believe any politician from any nation on the subject of 'Ukraine'? And thank God we have a sensible President, who hasn't taken sides, and is the ONLY President since Ike to have not started a war! Audrey, maybe that's why Obama got the Nobel Peace Prize – he actually knows what 'peace' means! (And of course, both Obama and Kerry are intelligent enough to have not come to any conclusions about this accident). sly has selective memory when it comes U.S. military action. He forgets that Obama intervened militarily in Libya without Congressional approval. He forgets that al Qaeda attacked us many times before Bush had the balls to take the war to them. He forgets that Hussein started the Gulf War by invading Kuwait and that he violated the terms of the ceasefire countless times, which is all the legitimacy needed to take him and his evil dictatorship down. But that's no surprise, since he hates America and all it stands for. Putin does not care about what Americans think: because you can not please the haters! Russia has freed itself of that delusion! So you can stop deceiving yourselves: it is not Putin who is your problem anymore! He has started it, but now as Russia has finally waken up and freed itself from ideological drowsiness, it is the Russian people who is your enemy! Now I want to see you trying to defeat it: you will not be the first to fail! The strategical enemies of the EU and USA are not the Russians. In the long haul, the Russians are rather the silly younger brother you want to be with when you are going in the woods. However, there are the needs of slapping this silly young brother from time to time when he misbehaves, such as when he behaves ungentlemanly with the daughter of the neighbor, or when he is shooting the passers-by with grandpa' s old gun. Since the silly young brother is a needy idle member of the family who cannot behave like the other civilized members of the family, cut his allowances (Russian banks line of credits), take away his toys (the French should not give them new aircraft carriers), and admonish him in front of the village (such as at the UN). If all of this is not enough, isn't time isolate him, such as banning all flights to and from Russia over an extended period of time. Perhaps, it could help for good measure to implement also a total interdiction of shipments of goods and services to and from Russia for a couple of months to see if Putin has a brain. Your government is a miscarriage of justice. It is very ironic that some of the funniest, smartest and most poetic peoples I have ever encountered are so insecure that they need to be told what to think and do by such authoritarian leaderships. But I guess you reap what your sow even as a nation, and America is no stranger to that. Democracy and it's ideals of free press and free speech are all inherently interwoven. Even Faux (FOX) News looks good next to Russian State Media. Democracy allows for FAUX News to shout at the top of their lungs the opposite of whatever Obama says and get paid well with accolades and fame. A House of Representatives and Senate who have the right to oppose him as vehemently as possible. A High Court to truly question his every Law. What would that politically charged TV programming get you in Russia under Putin,? How are his political opponents doing? Perestroika was a step in the right direction under Gorbachev. Whether I support Obama or not matters less every day because a new US President will be sworn in January of 2016. These are some of the fundamental differences between our Governments. Ones which make these Great 50 States a more perfect Union than anything Russia has or had. America isn't perfect but a whole lot more desirable then what you have. Good luck with Putin's good ole days of bread lines, oppression and international isolation. Big Business or Capitalistic Pigs if you like, in Russia and the West are to blame for the situation in Ukraine. The players may changed through history but their interests have not. Apparently Putin isn't going anywhere and the EU doesn't have the guts to do anything about this latest incident. Yesterday Georgia, today Ukraine, tomorrow? I can't get over just how ignorant fools there are here! Falling for all that right-wing BS coming out of Washington.. What do these people do for brains?!?!?! red neck crap...and that twit Fareed trying to act like a white man is a joke..throw him out..MASTERS OF WAR.. It is well known outside the USA that this country has fallen to government socialists, Zakaria being a deception specialist is also clearly known. The truth is too hard to cover up this days, and CNN must come up with outrageous stories just to get those poor left over fast food eating americans to be glued to their channel. Zakaria, I do not trust anything you say, I see you for what you are. It is over for you and CNN.... You are in the alternate universe of deception, lies and manipulation and everyone knows about it. CNN has become a TNN – Tabloid News Network with a Flashy Headlines with no details. Zacharia is another uncle tom stooge who is glad to be in America as oppose to his native India which is a fine country. He has a little inferiority complex so most of his commentary are pretty predictable. He will most often denigrate all that stand up to America as though no one else has the authority to want better for themselves or should equal America. We are all equal and no nation should rule over any other nation. Well put, Justin. Too bad the right-wing thugs in Washington don't see it that way! Russia isolated from the Woorld, except 40% of world population with 30%world GDP of BRICS countries, not considering middle east, south america, France and maybe Germany (and important US banks that have assets in Russia, which could be frozen soon). Of course US isolation hurts, but not kills. Exactly @ Roman, and our government needs to remember all this!!! Russia shouldnt be isolated so much, more though Putin himself should be! Solitary confinement actually! He could at least STOP firing while the Dutch are claiming the bodies at least! Its bad enough that none of them are showing any remorse, they could at the very least show some RESPECT!!!!! Putin is a murderer, liar & a coward. @ Get Your Facts Straight...who the hell are you talking too? A while back when NATO wanted to place missiles in Poland Putin complained that it made Russia uncomfortable and Obama blinked and cancelled the missiles. Now Putin is about to place missiles in Ukraine and the Obama administration can complain all they want. But Putin will not blink. Putin has already identified the US administration as being weak and naïve. Giving in to bullies only makes them stronger and you weaker. Agreed @ Felix. I have been a supporter of the POTUS since the beginning but i do wish he would get a stronger backbone! Now is no longer the time to play nice! Because it just does not work with some people. Especially with Putin, the spawn of satan. confronted with a vengence or righteousness by starting to bomb the real villian – Saudi Arabia and then pulling out of the Middle East all together. This Islamic insanity is going to lead to America going to war with Islam not to mention a future civil war if we keep letting these fanatics into our nation. Words of wisdom – to cure the terrorists problems is not going to be cured by ethnic cleansing Mexicans, buidling a border wall or patting down every American traveling. The solution is simple – ban Muslims from America!